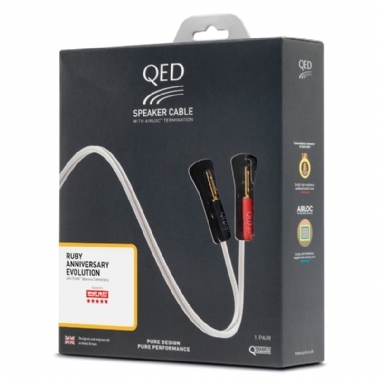 QED Ruby Anniversary Evolution Pre-Packaged Cables, Terminated with QED Airloc 4mm banana plugs and available in 2m, 3m, or 5m boxed pairs of speaker cable. The What Hi-Fi? Five Star award winning Ruby Anniversary Evolution cable is a completely new speaker cable from QED laboratories in celebration of FORTY years at the forefront of UK speaker cable design. It utilizes QED “Aircore Technology™” in a new miniature format to bring high end cable philosophies to the budget hi-fi market. It builds on the success of the XT Evolution and Ruby Anniversary cables with which it shares a family heritage but now incorporates increased conductor spacing to further reduce losses and distortions caused by cable capacitance.